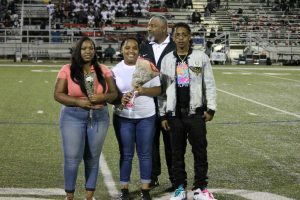 Bulldogs News · Oct 29 Football Senior Night 2018, a big THANKS to all the players, student trainers, and band members! 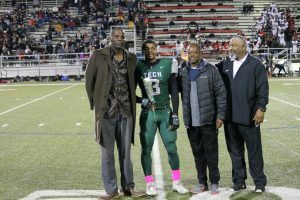 Thursday night at halftime, Trimble Tech honored those Seniors that were part of the football team this year and played years previous. Coach Henry and the entire staff would like to thank these student trainers, players, and the extended family of all of those that participated and helped put together senior night. Starting off we have one of our student trainers, Aajah Odom. 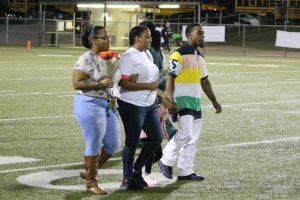 She is being escorted by her mother Katrina Jenkins, sister Princess Brown and Stepdad Drewary Brown lll. Aajah has been a student trainer for 4 years. 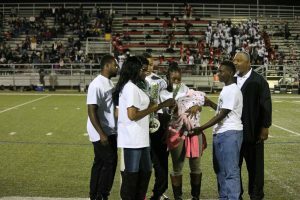 After graduation, Aajah plans on attending North Texas to major in Social Work. 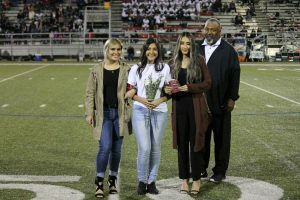 Student trainer Nancy Duran, she is being escorted by Daisy Duran and Damaris Hernandez. Nancy has been a student trainer for 3 years. 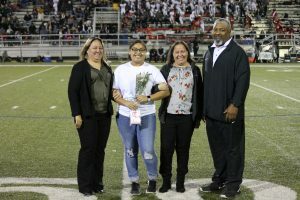 After graduation, she plans on attending Tarleton State University and major in Business Administration. Her future plans are to own her own business. 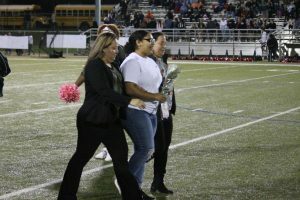 Student trainer Kayla Gonzales, she is being escorted by her mom Surah Gonzales and aunt Rita Gonzales. 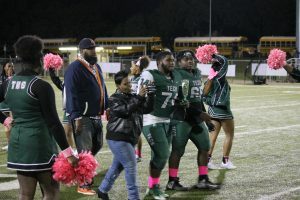 Kayla been a student trainer for 4 years. 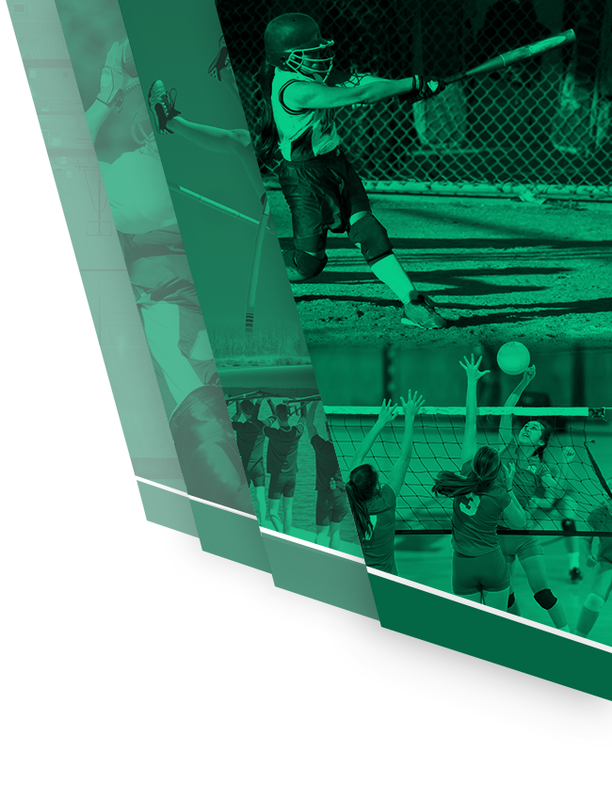 After graduation, Kayla wanst to attend Texas State and major in Anthropology. Her future plans to join the Air Force and later become a medical examiner. For our first player of the night we have #2, WR Gabe Woodard. 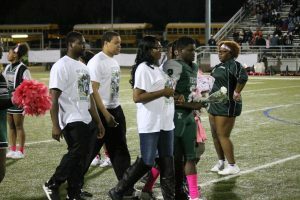 Gabe is being escorted by his mother Jeneau, brother Bryton, brother Michael Jr. and brother Torrin. 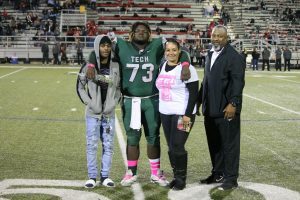 Gabe has been a part of the football and track program all 4 years he has attended Tech. Gabe has offers from Louisville, TCU, and Baylor. 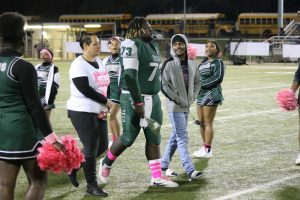 He would like to attend college to play football or run track and study Business in hopes of starting his own construction company. Next, we have #6, RB-DB Jalil Muhammed. 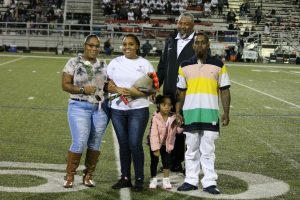 Escorting Jalil is his father Mr. Muhammed, mother Bridgett Henderson, grandmother Sheila and brother K. This is Jalil’s first year to played football and baseball at Tech. 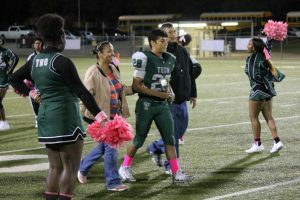 His plans are to attend Navarro College and major in Videography. His future plans to attend film school and to become a licensed barber. Our next senior is WR-S, #24, Austin Brawner. Walking with Austin is his mom Lanna, sisters Sheridan and Kinsley. Austin has played football all 4 years. Austin wants to attend college and play football while pursuing his degree in Architecture. Strong Safety, #28, Bryant Lopez is our next senior. 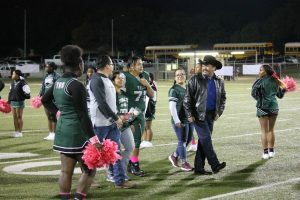 He is being escorted by Eduardo Lopez and Veronica Lopez. 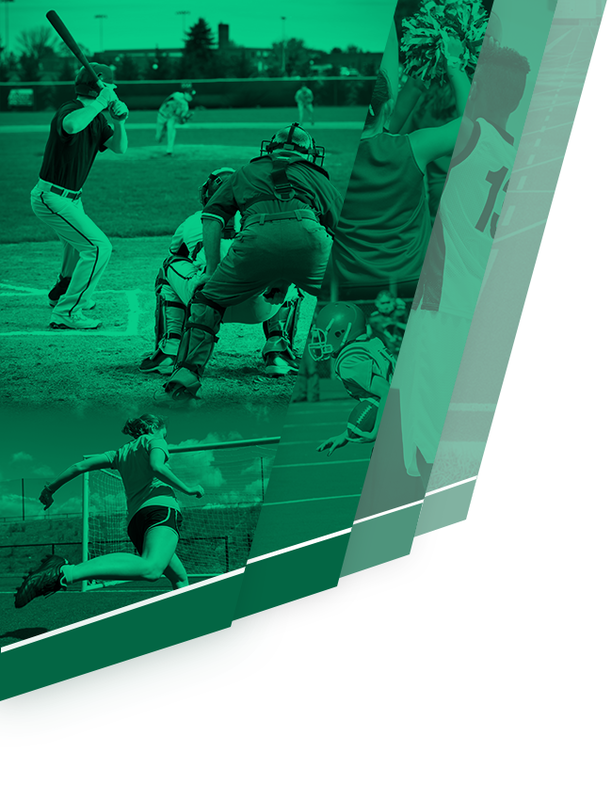 Bryant played football and track all 4 years while in high school. Bryant’s major at Tech is Auto Technology. His future plans are to be an inspiration to others no matter what. Next, we have #48, RB-LB Jaime Aragon. Walking Jaime is his Mother and Father Luis and Maria Aragon. 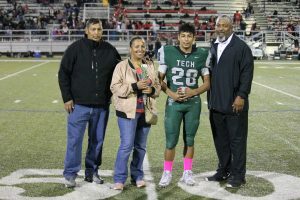 This is Jaime first year to play football at Tech and has also been part of the baseball team for the last year. Jaime is undecided where to attend school but knows he wants to study Engineering. 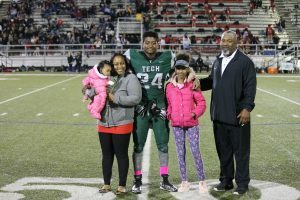 For our next senior we have #52, DE Isom Williams. 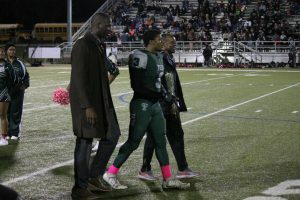 He is being escorted by his Father Torre Williams. 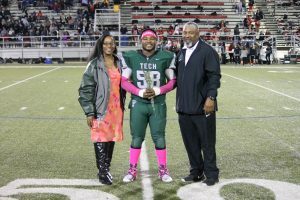 Isom has played football for 4 years and track all 4 years while attending Tech. 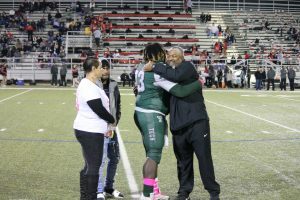 Isom plans on attending Texas State University to study Physical Science. Isom’s future plans are to become a Police officer. 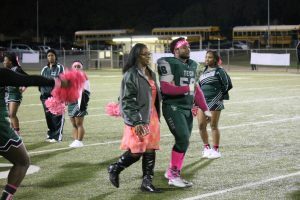 Linebacker, #58 Harrison Rice is our next senior. Walking with Harrison is his Mother Theresa Manns and brother Hayden. 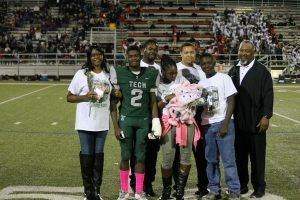 Harrison has played football and wrestled 3 of the 4 years he was at Tech. Harrison is undecided on what school he will attend but has heavy interest from quite a few. He wants to major in Architecture. After graduating college, Harrison wants to join the United States Navy. 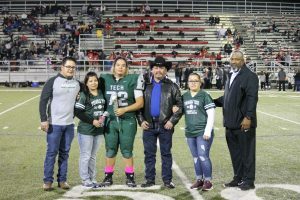 Next we have #72, Senior Offensive, Fernando Lujan. 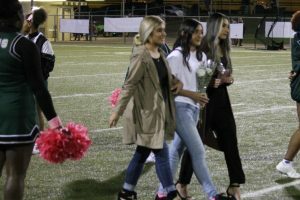 Escorting Fernando are his parents, Maria and Federico Lujan, sister Dulce and brother Manuel. 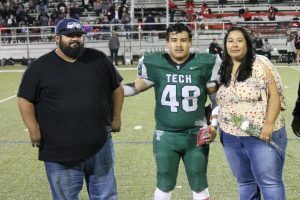 Fernando has played football for Tech all 4 years. He is will attend TCC and major in Architectural Technology. 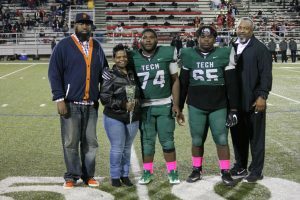 #73, Defensive Tackle, Kylan Owens, is our next senior. 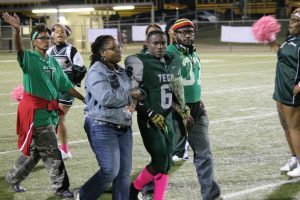 Walking with Kylan is his Mother Dee Owens. 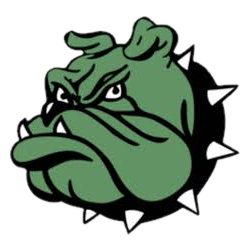 Kylan has played football 2 years for the bulldogs. 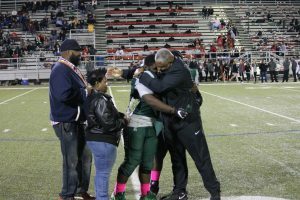 After graduation he plans to attend TCU and major in Business. 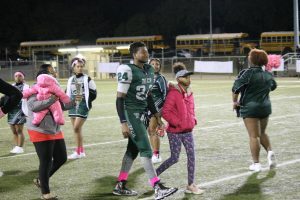 Kylan future goals are to play in the NFL and later become a football coach. Next we have #74, Offensive Lineman Keylan Rodgers. 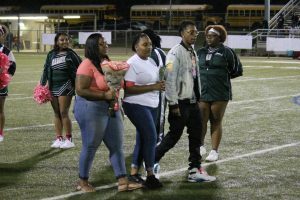 Escorting Keylan are his parents Rodney and Shannika Rodgers and brother Neiman. 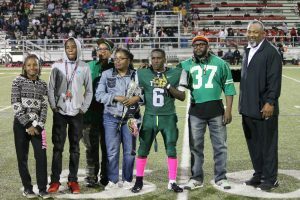 Keylan has also played football all 4 years for the bulldogs. 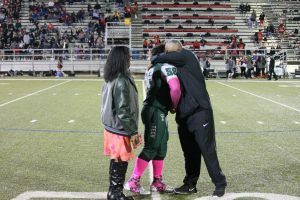 When he graduates he would like to attend Texas State University to major in Kinesiology/Physical Therapy. 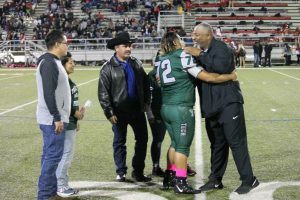 #79, Offensive Line Jose “JoJo” Escutia is up next. 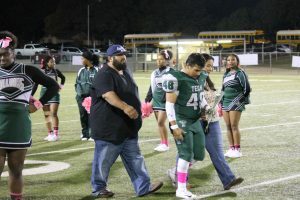 He is being escorted by his mother Jessica Lazoya. 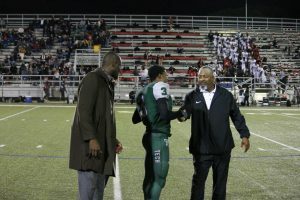 Joseph is another 4 year player for Trimble Tech. JoJo plans are to become a master electrician and start his own business. 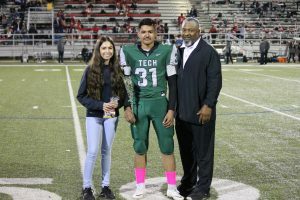 Next we have kicker, # 31 Adalberto Briones. 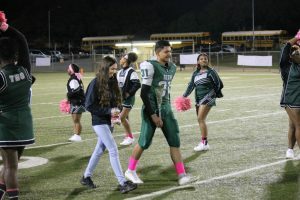 He is being escorted by his girlfriend, Valerie Ceniaceros. 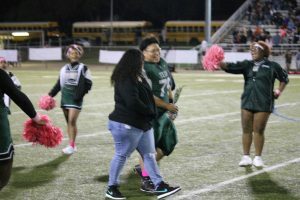 This is Bertos 1st year kicking for the football team and he has played 2 years on the Varsity soccer team. 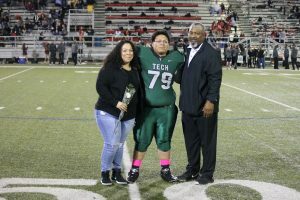 When he graduates he wants to attend The University of Texas at Arlington to study architecture in hopes of becoming a residential architect. 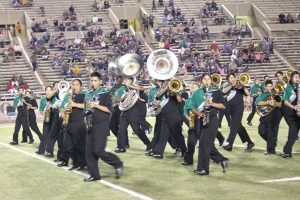 We would also like to say a big thank you and congratulations to all the senior band members who were also honored Thursday night, unfortunately we did have a football game and I was unable to get pictures and bios of all of them. Mr. Belk and Mr. Reinhart have done a wonderful job filling big shoes and it shows with the amazing job these seniors and the rest of the band have done this year. Congrats to all of our seniors and best wishes in your future endeavors!